Cycle responders in NHS are fully trained to work on their own and operate in busy areas which are difficult to travel through in a car or ambulance. Staff on bikes in London can get through narrow streets, pedestrian areas and shopping centres very easily. They are able to reach patients quickly and start to give life-saving treatment while an ambulance is on the way. 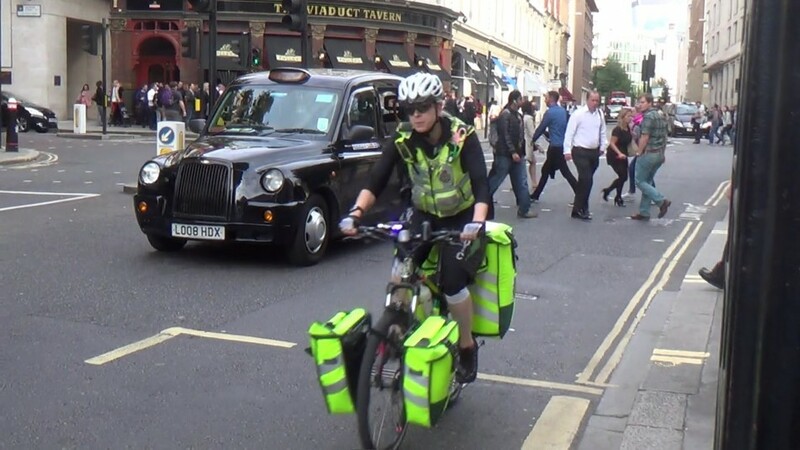 The London Ambulance Service cycle responders have equipment designed to enable them to respond to emergency calls: a custom-built bicycle, medical kit and specialist clothing. They respond to emergency calls in particularly congested areas of the capital such as the West End, Heathrow Airport, Kingston town centre, the City of London and St Pancras. Cycle responders use custom-built Specialized Rockhopper mountain bikes fitted with blue lights and a siren. The bikes are lightweight and include a strengthened back wheel and stronger spokes, puncture-proof tyres, lights, pannier bags and water bottles. The London Ambulance Service cycle responders’ kit includes, among other things: a defibrillator (used to re-start a patient’s heart if they go into cardiac arrest), oxygen, entonox (commonly known as gas and air), a pulse monitor, a blood pressure monitor, adult and child bag and mask resuscitators, adrenaline, aspirin, asthma and diabetes drugs, bandages and dressings, rubber gloves, and cleanser. The NHS professionals are equipped with specially-designed uniform, wich includes: helmet, gloves, glasses, reflective jacket/jerseys, trousers (shorts for warmer weather), waterproofs, cycle shoes, base layers, padded undershorts, skull cap, anti-pollution mask, protective body armour, utility belt, a radio, and mobile phone with Bluetooth headset. Cycle responders attend approximately 16,000 calls a year. They resolve around 50 per cent of all incidents at the scene. Their average response time to calls is six minutes.